As much as we’d like it not to be true, we can’t be with our dogs 24/7. Whether it’s work, hobbies, community events or social commitments that pull us away, part of our bond with our pups has to do with how excited we both are when we get reunited after any period of time. Walking into your house after a long day of work and being greeted by your tail-wagging best friend? Nothing better. But imagine being away from your fur baby not just for a few hours…but for years! That’s exactly what happened to one dog owner, Nathan, who was away for 2 years on a mission trip. 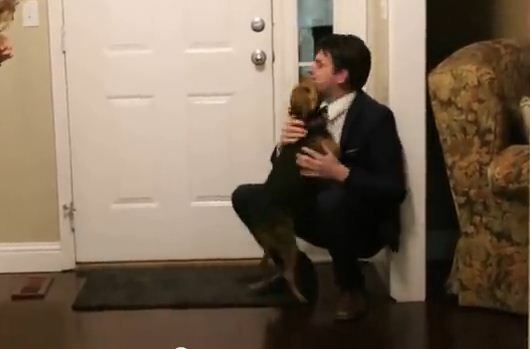 When he walked through the door his first time home, though, his adorable Beagle mix, Bailey, excitedly welcomed him back. Bailey’s reaction to his long lost human is so heartwarming; she jumps and squeals and romps around – it’s clear he’s missed his owner and wasn’t sure he’d ever see him again. Two best friends reunited after all that time – such a sweet sight! How touching is that!? What’s the longest you’ve ever been away from your dog? Howdid they react when you two were reunited? Share your story in the comments! I love the video it is heartwarming.It tell how much they miss you.